This is a hearty, rich main course dish which could be varied endlessly with sides and additions, vegan or not. One could of course serve it with starches such as noodles or potatoes, but I find that it is substantial enough on its’ own. 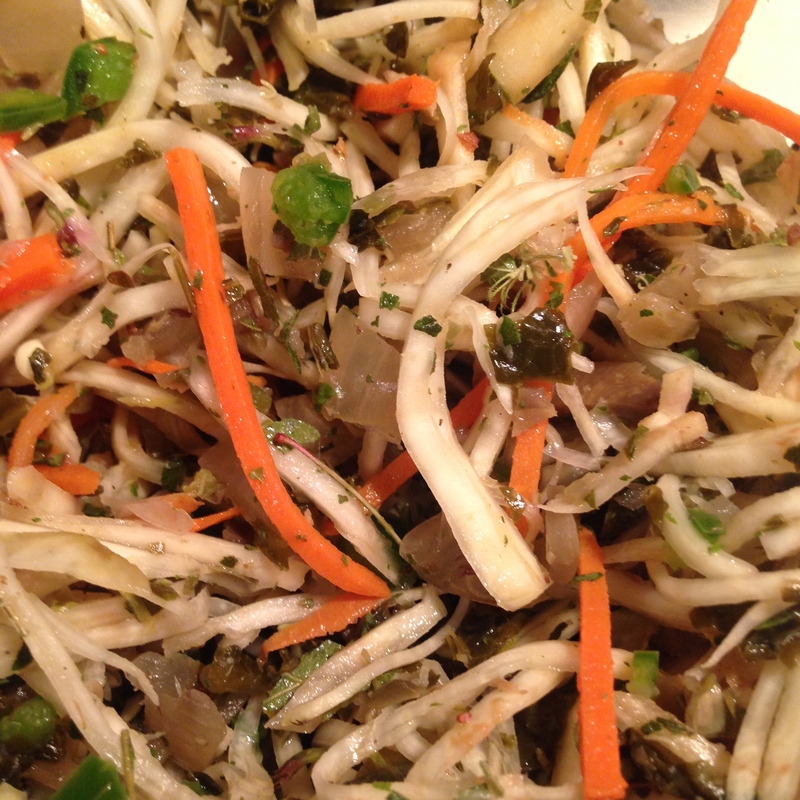 In fact, what I will recommend is a garnish of sharp, very thin raw vegetables and fresh herbs, if possible. Like all proper stews this dish is much better reheated and served on the second day. I roast the beets and then add them to the dish before adding the spices for aesthetic reasons. They change the color of the dish quite dramatically, but in a nicer way then when added in the beginning. One of course could use golden beets or white beets instead and dispense with all this roasting nonsense. This is a dish in which prep and timing are pretty essential. Have all your ingredients chopped and sized, take your time about the cooking of this and remember to let it cool, sit overnight and then serve the next day. It will be much the better for it. The beets are done when they a little bit more firm than you want in your finished dish. Remove them, keeping them wrapped and let them cool naturally. Sautée for 5-10 minutes, until softened. Sautée for 5 min or so, until softened. Sautée for 3 min or so. Sautée for 5-10 min or so. Enough vegetable stock (preferably a rich roasted stock) or other stock or water to cover the vegetables well (1-1.5 quarts), bearing in mind the beets to be added later. Bring the pan to just short of a boil, then cut the heat to a slow, mild simmer. 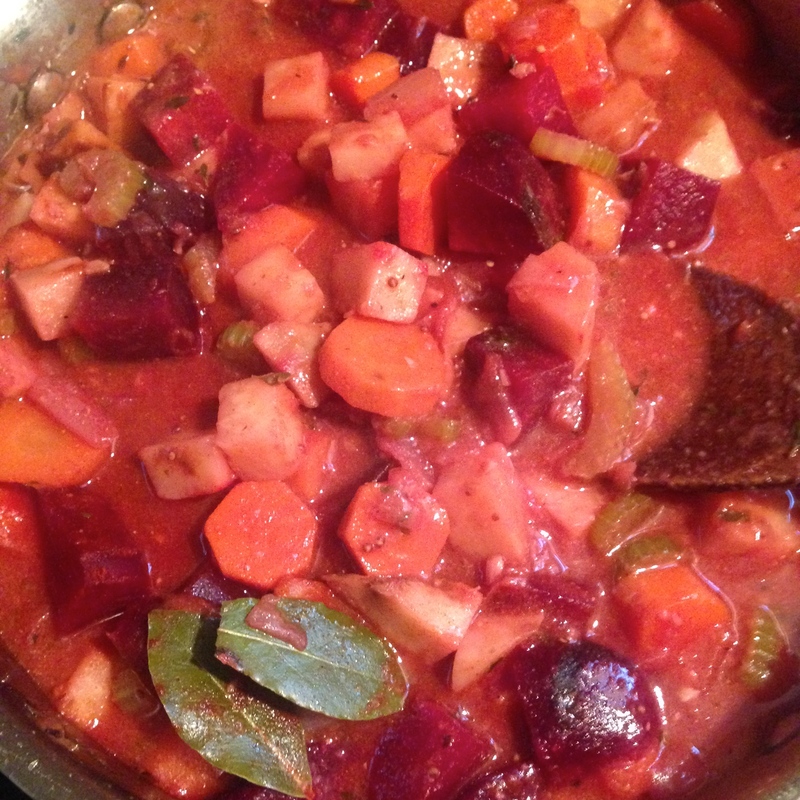 Allow this to cook until the sauce has thickened and the vegetables are close to being tender enough to eat. Always bear in mind that the vegetables will cook a bit in their retained heat. If the vegetables seem close to done and the sauce is far too thin for your liking you can add a liaison. Heat some oil and whisk in an equal amount of flour (I usually go about 2 tbs of each), whisk and heat for a minute or two, then add in some of the hot fluid from the stew. Keep adding fluid until you have something that is not yet liquid but no longer paste. Add this back into the stew and it should thicken up nicely. The cooked beets, which by now you will have peeled (very easy once roasted) and cut into the appropriate size (1″2 x 1″ chunks in this case). Allow this to cook for another few minutes, then adjust your seasonings as needed. Serve right away or allow to sit. Reheat the next day and serve with fresh garnishes. All times used are approximate. I cook by taste and texture. It’s far easier and more accurate than following a clock. 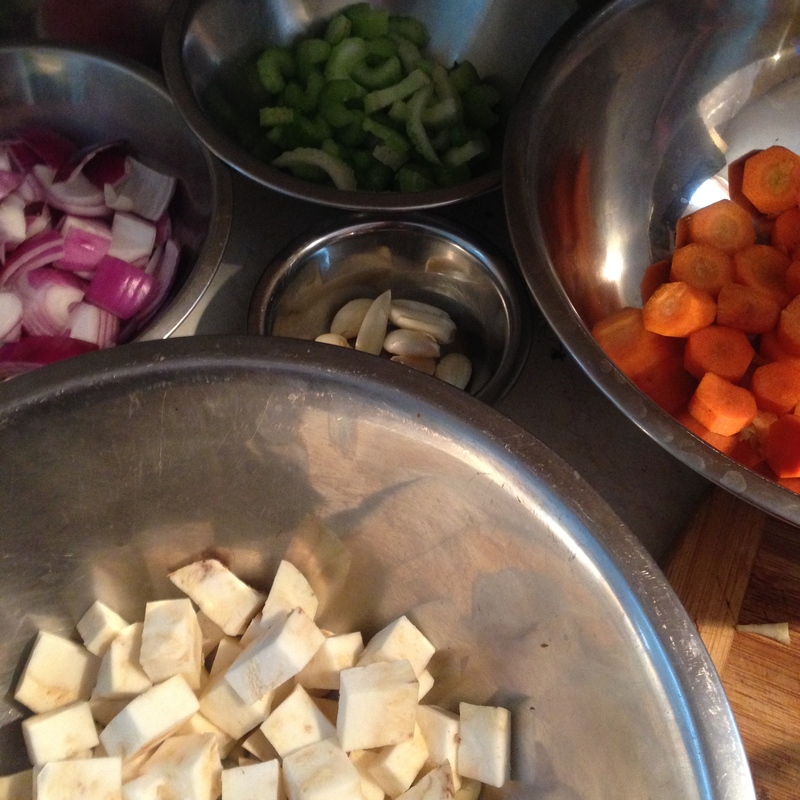 In each stage of the sautée, the vegetables should be cooked until they begin to soften. If the pan gets too dry (which shouldn’t happen) you can add some extra sherry or wine, or water if necessary. The stewing process will take from an hour on, depending on how slow your simmer. Allow it to develop on its own, checking and stirring every 10 minutes or so. You will know when it is done. This recipe can be varied in what vegetables are used, provided they are approached with understanding of how long they take to become tender. Of course it could be garnished or accessorized in dozens of ways. It’s already pretty hearty in itself but if you wanted to serve it with noodles or rice I’m sure it wouldn’t be bad. I prefer to go the other direction, and add something sharp and bright as a garnish, like paper-thin slices of spicy black or daikon radish, fresh snips of chive or field garlic, raw chiles, pickled or preserved vegetables, and of course fresh herbs if available. I have left the spicing at kind of an entry-level dosage. All of the seasonings can be added again at the end, which is usually when I toss in a little more thyme or juniper or mustard or what have you. The flavor is hearty, and deep. It may remind one of a treatment of beef or pork in terms of the flavorings used, but this is no meat substitution recipe. The combination of thyme, mustard and paprika complements the beet-celery root-carrot trinity. But perhaps you will discover an even more perfect one! Key : The key to this recipe is making all the vegetables the same consistency, particularly one that has a bit of texture to it. For some people that solution lies in very precise cutting, for me I’ve always just preferred to add the ingredients one by one and rely on intuition. Some people like to throw in everything at once and cook it long and slow. There’s no right way, just one that works.